With effect from the October 2018 Case Shiller Home Price Index press release, Seattle officially dropped out of the nation’s top three residential markets by home price growth: “Las Vegas, San Francisco and Phoenix reported the highest year-over-year gains among the 20 cities [subject to the Case Shiller Index]. In October, Las Vegas led the way with a 12.8 percent year-over-year price increase, followed by San Francisco with a 7.9 percent increase and Phoenix with a 7.7 percent increase.” At 7.36 percent growth over the past 12 months, Seattle was not far behind; but the monthly result on the index (-1.05 percent) remained negative for a fourth consecutive month. Seattle has seen three four-month-long negative runs on Case Shiller since February 2012. Contrary to recent headlines in the Seattle Times, monthly home price declines are seasonal in the fall and winter, and prices in the region are still higher year-over-year. Las Vegas homeowners continue to recover value from their losses suffered in the 2008 subprime fiasco, when the city was “hardest hit … with prices down 62%,” according to Blitzer. We expect this trend to continue, bearing in mind that Las Vegas is a highly speculative market and like Phoenix, a destination preferred by some home-owning pensioners in high-tax states seeking to cash out value for retirement. Prices are lower than in the other cities we track, and Las Vegas homeowners have a lot of catching up to do. 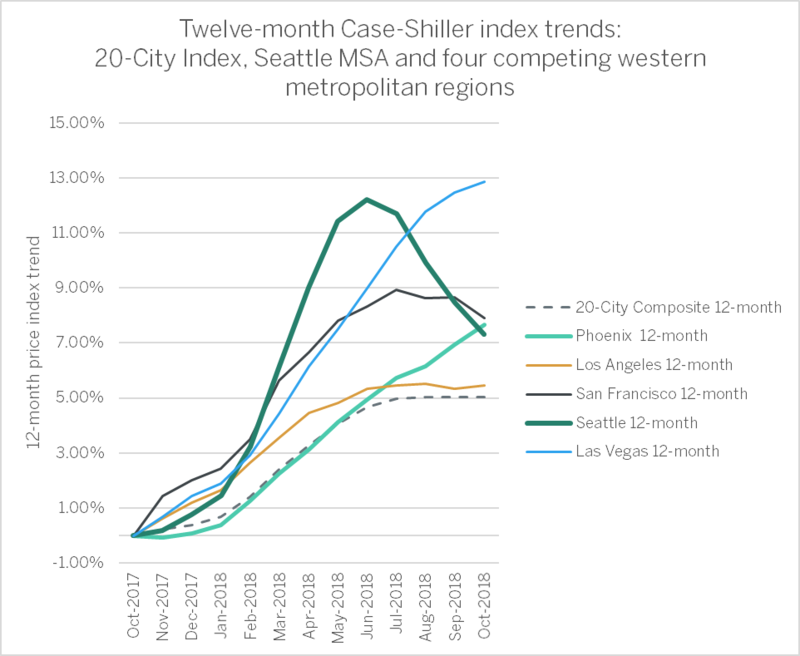 You can see the progress of that recovery in the chart below, which shows Las Vegas alone among Seattle’s competing cities in having made year-to-date gains of more than five percent against Seattle’s residential price trend. Yet though Seattle is out of the top three, home sellers here are still well-positioned. Under the traditional definition, any home-selling market with less than six months in inventory remains a seller’s market, although conditions in the Puget Sound region appear to challenge this understanding. 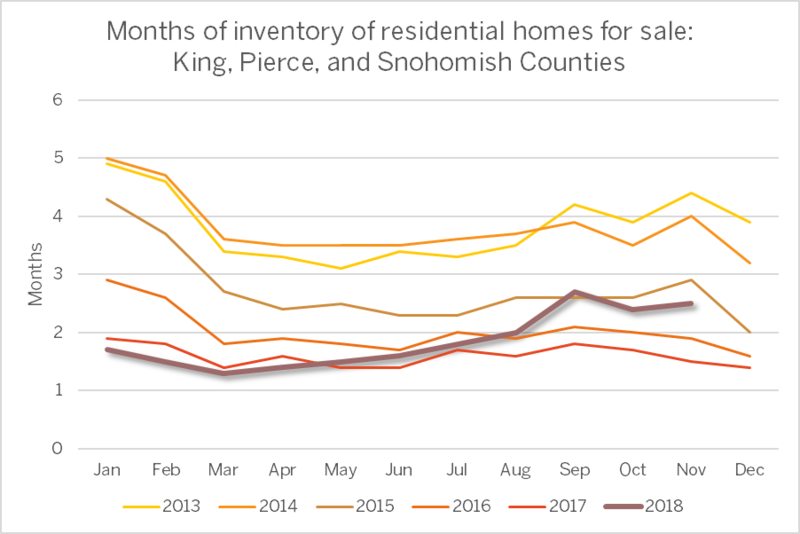 As seen in the chart below, this year’s Seattle market inventory surpassed that of 2017 in May, 2016’s in August, and briefly, that of 2015 in September before heading lower in October. We’ll soon see whether the 2015 inventory level is breached again, but those of 2014 and 2013 appear quite out of reach. The below chart shows that the reported “Amazon Pause”—an abatement in home selling in anticipation of Amazon’s HQ2 selection—only lasted one month, with regional purchases of homes recovering in November. Seattle also fares well in any thoughtful comparison of the top three markets. 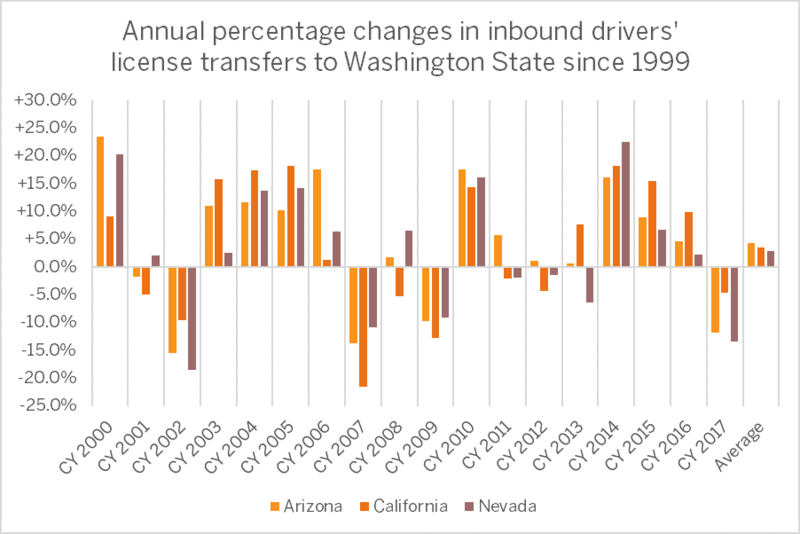 The annual percentage changes in the numbers of these transfers from California, Arizona, and Nevada alike show a history of procyclical moves to Washington State. In times of economic strength, our state, and the Puget Sound region in particular, have succeeded in drawing new residents for business opportunities and employment. However, even as the economy has waxed and waned, the long-term trend for all three states has been an increase in the annual numbers of transfers to Washington State since 1999: +48.2 percent for Nevada, +62.5 percent for California, and +91.6 percent for Arizona. American Community Survey data from the U.S. Census indicate that from 2013 through 2017, roughly 70 percent of the buyers in Phoenix and Las Vegas were moving up from a prior residence in the same county. This compares with about 60 percent of buyers doing so in the Seattle MSA; and only half of buyers in San Francisco, possibly under the influence of Proposition 13 in California. The same data show Phoenix benefiting from in-migration from other U.S. states: 20 percent and 23 percent for Phoenix and Las Vegas respectively—comparable with Seattle’s figure of 19 percent. All three regions exceeded San Francisco’s 12 percent of new residents from other states. Census data do not capture the numbers of vacation home and second-home buyers in these states, which further distinguish these markets from those of Seattle and many other cities of this size. Both Las Vegas and Phoenix see large numbers of these non-resident buyers. As recently as 2016, 118,000 homes in Maricopa County, Arizona were categorized as “second homes,” the greatest concentration of such homes in the country. The Census ACS data do also reveal population characteristics that attend the procyclical nature of inbound migration to Seattle, and underscore important differences between Puget Sound markets and those in Phoenix and Las Vegas. One of these is educational attainment: respectively 41.2 percent and 47.4 percent of Seattle and San Francisco residents benefited from four-year college degrees or higher, compared with respectively 30.3 percent and 23.2 percent for Phoenix and Las Vegas. Again, people move to the former cities to accumulate rather than to liquidate wealth; and in Seattle, they enjoy an extraordinarily high quality of life. RSIR made first mention of the “Amazon Pause” lifting in downtown Seattle condominiums on a recent King 5 TV News interview noting that downtown closings so far in December have trended upwards by 45 percent over November. Jones thinks the increased cost of construction, rising interest rates and resale supply trends could clip the enthusiasm for additional high-rise condominiums in the near-term pipeline, making those projects already in reservation and presales rarer as some planned projects defer for the next cycle. The final chart is our illustration of the trend for the 12-month gain on the Case-Shiller index. The trend for competing Pacific Coast gateway San Francisco has perceptibly turned, and Phoenix and Las Vegas are both recovering from home values that suffered considerably during the subprime bust. For more details on the October Case Shiller Index results, download the S&P Dow Jones Case-Shiller summary report. For details on the implications for homes in your neighborhood, contact a local RSIR broker for their latest analysis.